Want to be notified of new releases in NullDesk/ticketdesk? 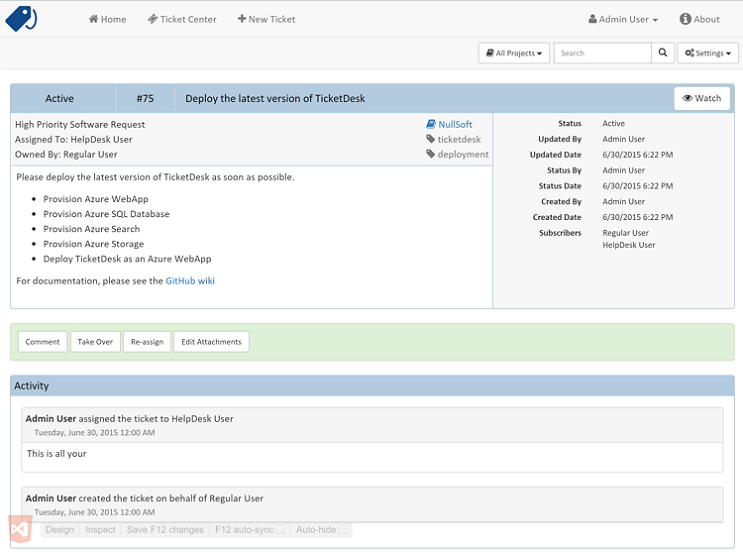 TicketDesk is an issue tracking system for IT Help Desks. TicketDesk is efficient and designed to do only one thing, facilitate communications between help desk staff and end users. The overriding design goal is to be as simple and frictionless for both users and help desk staff as is possible. The previous version is also available TicektDesk 2.1. TicketDesk 2.5 requires Visual Studio 2015 with .Net Framework 4.6.2 or higher. Getting started with TicketDesk development should be a "clone, open, and run" experience. You need Visual Studio 2015 with the latest update, or Visual Studio 2017. By default, TicketDesk will use SQL Server Express LocalDB Edition 2014 or 2016. TicketDesk is a straight forward ASP.Net and SQL server application. Please see the Quick Setup Instructions for an abbreviated overview of deploying TicketDesk.